Generally speaking, the volume of transaction data is considerably high. A full update here is mostly only justified for the first time data is transferred or if the statistics data has to be rebuilt following a system failure.Delta update mechanisms that restrict the volume of data to within realistic limits, therefore, are required to implement a performance-oriented, periodical data transfer strategy. Therefore, when sales figures are updated every week in the Business Information Warehouse, only the sales document information that has been added or changed in the last week should be extracted. This functionality is used by the central D-management with the LO extraction method.According to how the V3 update is set up, document data (customer orders and so on) is processed when the update is started. That is, the relevant (active) communication structures are filled and forwarded to the central D- management.The cDM then 'parks' it in the update table ARFCSDATA until it is requested by the BW System. The data remain in the table until the last request for it is successfully processed. LO data extraction can be used to completely remove the extraction with transfer structures (for example, S260 - S264 in SD) and extraction using 'traditional' information structures in the LIS (for example, S001 - S006 in VIS), without missing out on any information.This means that more information with more detail can be loaded into the SAP BW System with LO extraction. the steps as described below. Find time frames in which there are no updates for the info structures you want to replace. IMPORTANT: Make sure that no R/3 data updated for the DataSources in question when you carry out these steps. Switch off update for LIS extraction. 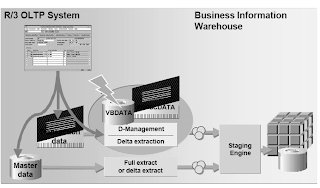 Switch on update for LO extraction (TA SBIW).Load the delta queue of the old Info Source into BW so that all delta records of the old source come into and are posted to BW (important so that no changes or new records are lost and that the data stays consistent). Do not refresh the statistics for the new Data Sources, or else records will be posted twice in the Info Cube. Steps 9-11:Simulate an initial load for the new Info Sources' delta upload (option in the Info Package).This simulation run must 'pass green'.The update can take place now. When the V3 update has been scheduled for the new Data Sources,the delta queue is filled and the data can be loaded for the new Data Sources.